Dr. Ruth Dorot is lecturer in art history at Bar-Ilan University and Ariel University Center in Israel, and is involved in various enrichment programs for the general public. She has served as curator of exhibitions, including “The Psalms in Letters and Colors” and sits on the editorial board of professional journals. She is the author of the well-received Galut Vehitgalut (“Exile and Revelation”), and the recipient of the Israel Efrat Award (2000). Her well received The Art of Time, The Art of Place: Isaac Bashevis Singer and Marc Chagall – A Dialogue, was published in 2011. 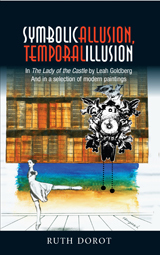 This book draws parallels between literature and the arts, and between drama and painting, in terms of Time and Symbolism, as they appear in the play The Lady of the Castle by Leah Goldberg, and in a group of selected paintings by Marc Chagall, Salvador Dali, René Magritte, Paul Klee and Edward Munch. Discussion focuses on the connection between the written play-text and the paintings through their common visual qualities and in terms of their common thematic, structural and stylistic characteristics. In a world dominated by science and technology, which renders belief in any “absolute” problematic, two seminal events have left a permanent mark on the contemporary concept of time: Einstein’s theory of relativity and Bergson’s philosophy of duration (simultanéité and durée). In their wake, Time has become relative and fragmented – a central theme in the play and in the selected works of art under discussion. Objective, scientific and chronological time is contrasted with inner, psychological time (duration), which differs from individual to individual and from culture to culture. Four categories of time are assessed: historical, physical-chronological, psychological and eternal. The primary meaning behind a symbol makes the basic assumption that a particular object or entity may represent another essence. In attempting to understand the temporal/symbolic linkages of the text and paintings, much importance is attributed to the relationship between ‘representer’ and ‘represented’ and between concrete and abstract. Through symbolic abstraction one is able to better comprehend the human and cosmic phenomena the symbol seeks to decipher. Symbolic Allusion, Temporal Illusion deals with a castle. This central symbol of the play and the paintings is multifaceted, representing what is manifest and what is hidden within the castle, revealing a magical encounter between the world of words and the world of colour.